When Joss Whedon’s Avengers: Age of Ultron was filming in London last summer, I got to visit the set along with a few other reporters. Like most Marvel set visits, they let us talk to the entire cast and watch filming. While the production was guarded about what they were willing to tell us, we learned a ton of cool secrets behind what’s bound to be one of the biggest films of 2015. 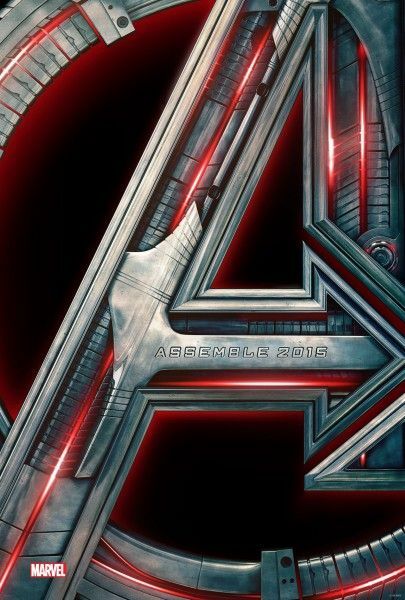 In The Avengers sequel, Iron Man (Robert Downey Jr.), Captain America (Chris Evans), Thor (Chris Hemsworth), Hulk (Mark Ruffalo), Black Widow (Scarlett Johansson), and Hawkeye (Jeremy Renner) reunite to stop Ultron (James Spader) from carrying out his sinister plan. 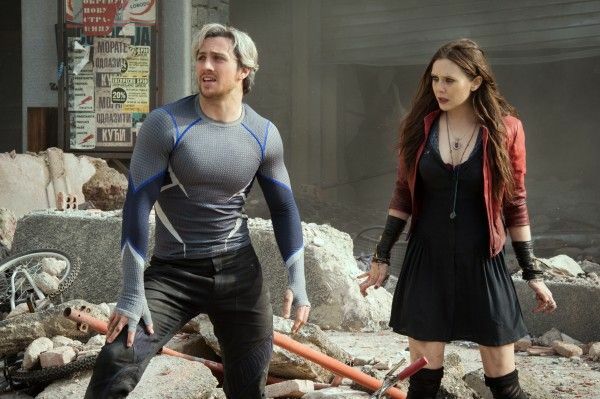 “Uneasy alliances and unexpected action pave the way for an epic and unique global adventure.” The film also stars Elizabeth Olsen, Aaron Taylor-Johnson, Paul Bettany, Don Cheadle,Andy Serkis, and Samuel L. Jackson. While on set, I participated in a group interview with Mark Ruffalo. He talked about Bruce’s relationship with Tony, fighting the Hulkbuster, The Vision, Bruce’s relationship with Black Widow, what Scarlet Witch brings to the table, whether Hulk has any cool one-liners, and a lot more. Hit the jump to read or listen to what he had to say. Click here to listen to the audio of this interview. Question: So when you got the script and you were noticing that the beginning has you in a relationship with Scarlett, were you like, “Yeah, this is going to be a very tough job”? MARK RUFFALO: We don’t have a relationship. What kind of relationship? We’d heard that maybe there was a closer relationship between the characters. We’re embargoed for a long time. RUFFALO: I was just happy that I was in the movie at all. And any scenes that I got to do with her were a big bonus. It seems like the response to The Avengers and the way Hulk was handled and the way Bruce was handled, it feels like Marvel finally figured out that character and you guys were able to finally create the definitive Hulk on film. This time around what is the balance between Banner and the Hulk and are you still struggling to not let him out? Or now that he’s become a hero is there a little more incentive to let him off the leash sometimes? 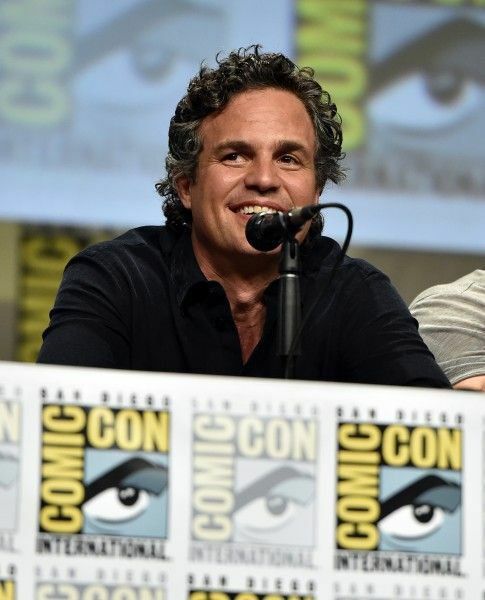 RUFFALO: There’s more of him and I think there’s still – Banner and Hulk have kind of come to a detente [laughs]. We left this last one with this idea that I’m always angry and therefore I have some control over it, but like anger, when you think you have control over it, you absolutely don’t. So there’s still a wrangling going on and there’s a confrontation brewing between the Hulk consciousness and the Banner consciousness that I think we’re starting to head into right now. We got a really good idea of the relationship between Tony and Bruce in Avengers, in Iron Man 3 it’s kind of hinted that it’s continued, we’ve heard that they both have an extremely important role in the creation of Ultron. This seems like a very central relationship. Can you talk about that in this film? RUFFALO: Yeah, you know basically Tony took the orphan Banner into the fold. 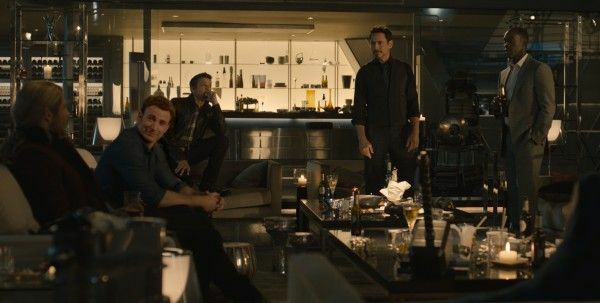 I was just made aware of where my apartment in the Stark complex is, the Stark Tower, and so I think they’re working – I have a lab now and Banner’s working on a lot of stuff and Tony’s working on his own stuff and they complement each other and so you could tell into this film that they’ve been working together and they’ve got even more of a shorthand together and really know haw to work well together. So that’s been built out quite a lot and it’s fun. It’s cool. They mentioned yesterday that you fight Tony in his Hulkbuster armor. Is that like a, “Hey can I take you down?” Is that more of a mutual decision fight? RUFFALO: It’s a little bit like Cool Hand Luke that way. “Do you think you could beat me? I’ll beat the crap out of you. Then I beat the crap out of him. It’s kind of like that, but not totally like that. It has a surprise to it, a little twist to it as well. You and Joss did a really good job developing Banner in the last movie. We haven’t really seen him much since then, but when he came into this movie did you guys have more places you wanted to go with him? Did you already know from the last movie that there was more stuff you wanted to develop? 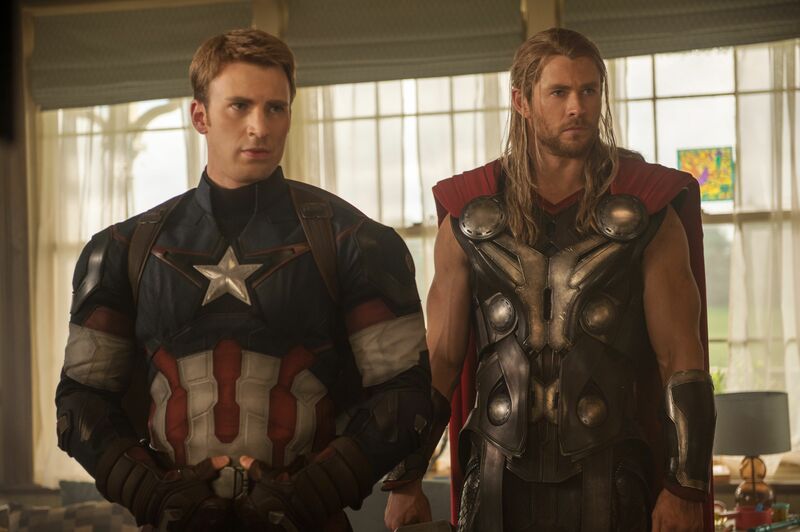 RUFFALO: Yeah, he’s sort of – I think he’s trying to become more part of a group. I don’t think he’s ever felt like part of a family or part of something, he’s always been this outsider on the run trying to shun humanity. But now I feel like he has the idea that maybe he is a part of something. He’s trying to really be part of something and feels more comfortable I think with the fantasy that he can actually be part of something. But I still think it’s a struggle for him and I never think that he quite has it under control. I think in this version he’s sort of as close to having a normal life as he possibly could, which might include some romance, but is that ever possible for Banner? That’s really the question. Cap, Thor, and Iron Man had their own movies to develop their characters, is it harder to do that in a movie that’s as big as this one? RUFFALO: Well I think the mythology of Banner is kind of known because of the other movies. We’re sort of building off of them, but it’s similar, he’s on the run, he doesn’t want to turn into Hulk and all people want him to do is turn into Hulk. So it’s not as uphill a battle as introducing a completely new character. The nature of these movies is there’s eight of us and I kind of worked it out and I think it’s ten minutes of screen time for each of us if we each – and then if we include the bad guys. So it’s hard to do a lot of character development, but I think this movie goes even more into that than the last movie. So you’re sort of playing catch up, but also I think you want to be ambiguous enough not to cover too much ground so that you have somewhere to go if they ever do want to do another standalone. We’ve heard that Andy Serkis was somehow involved form the early stages of this one, which is fascinating and certainly performance capture gets more and more advanced every year. What’s that process been like for you and how much more of you is there in the Hulk? RUFFALO: We’ve done a lot more with the motion capture, and since the face capture and the motion capture can now be put together you’ve just got a lot more latitude as a performer. Andy’s been working on this new frontier of taking motion capture and instead of it just being a placeholder, the actor being basically a placeholder for the CGI, that it becomes more of a collaboration and the actor really can add performance to it. And on the last one we were trying to do that, but it was difficult. Now the technology has taken another step forward. Andy has created a kind of space and this new attitude towards motion capture that kind of honors the actor a bit more than it was in the past. Not that there was dishonor, it’s just this organic process of making those two things work really well together in the context of the production of another movie – a movie that has a first unit going and lot of importance is put on the first unit and now they’re starting to look at motion capture in an equal sort of way. That’s what Andy’s after, that’s what I’m after. So I see the motion capture as this incredible new place for us to go in performance that we never had before, that’s more like kind of puppeteering. You no longer are constricted by the attributes you have as a person – your age, your weight, your size – none of that matters anymore, so there’s this whole exciting place to go that’s kind of unknown. It must feel almost like going back to your theater roots. RUFFALO: It’s very much like theater, because it’s all imagination. You don’t have a forest in front of you in the theater, you don’t have a castle, but you have to put that there for yourself. So whatever theater training I had is very very much in tune with this, oddly enough, the oldest form of acting all the sudden meets the newest form of acting and they’re very compatible to each other. It’s very exciting. Andy has really done a lot to make it so the actor is driving. RUFFALO: That’s a bad trip, man. Is she able to just call up the Hulk and control him? RUFFALO: It’s not…She’s able to bring out…[pauses] the worst in us. There are people in our lives who can do that, and somehow when you’re an actor you tend to gravitate towards those people, but she’s that bad – it’s like Sid and Nancy. She’s everyone’s Nancy. [Laughs] Of all these new characters that are in this movie, is there someone that excites you the most, that you think really think is cool and that audiences are going to freak out about. RUFFALO: I love the new kids on the block. 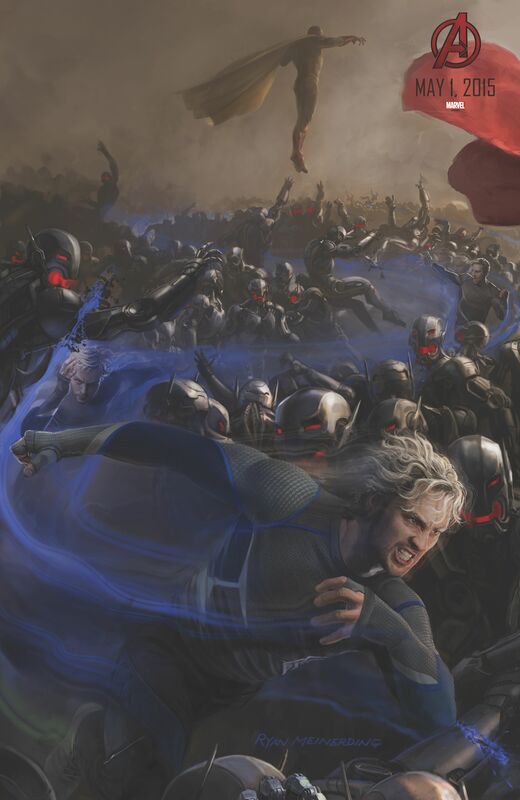 I love Wanda and Pietro, Quicksilver, they’re cool. They’re really cool and good characters. RUFFALO: The Vision is the Vision. He is so dope, and he’s my baby. [Laughs] Yeah, he’s pretty incredible. The idea of him and where he comes from. He’s very independent. It’s a really great character. Yeah, people are going to love the Vision…and Ultron is amazing. He’s amazing. It’s really good. How much one on one time did you have with Spader? RUFFALO: We have a lot of scenes together as a group, I don’t really – I have a couple one on one things with him, but I love him. He’s great, and he’s going to be…it’s like King Lear. It’s great. Do you enjoy watching Paul Bettany get tortured as much as Robert [Downey Jr]? RUFFALO: All I know is that I’m happy that I walk in and I leave the trailer and I can go back an hour later and Paul Bettany’s still in makeup. I’m 46 years old so that makes me feel good…sorry Paul, but you should see him. He’s a specimen when he walks onto that thing. He’s like, the perfect man. He’s the Vision. I’m curious about this cool little house party that goes on in this movie. Are you as Banner or are you as Hulk? RUFFALO: [Laughs] Banner. Indoors I have to be Banner, that’s kind of the rule. It’s like leave your shoes at the door, leave your Hulk at the door. They don’t like him being – Hulk still has a little bit of an ADHD kid thing going on. I’m curious about how much dialogue Hulk might have in the film. In the first movie he has two amazing lines, “I’m always angry” and “puny god”. Does he have anything like that in the sequel? Does he have any cool one-liners? RUFFALO: We’re sort of still working it out. He will, we’re just trying to figure out – there’s a couple different places to do it, but he’s not going to have a soliloquy, not yet anyway. We’re working for that. Joss has a couple ideas where to put that. Has he told you the lines yet? RUFFALO: No, that’s the thing, but I kind of know where we’re headed with it, but he hasn’t given me the lines yet. Talking with Joss yesterday, he told us one of the dominant themes in the films is being destroyed by power, and obviously there’s a lot of power that exists within Bruce Banner. I’m curious how you see the theme affecting the film overall and specifically towards Bruce. RUFFALO: I mean the central struggle that he’s having throughout his life probably, but specifically in this, is that he does have that destructive side to him. That’s never going to go away. You can live a fantasy that that might be under control, but ultimately that might just be a fantasy for him. That conflict is always going to be there. There might never be a resolve to that, because that power is really destructive. Is he still constantly searching for that solution? RUFFALO: I don’t know, I think he – yeah, he wishes he could find it, there’s no doubt about that, but also you start to be a certain age and you have to practice radical acceptance or you just keep banging your head against the same wall, and I think he’s starting to get to that place. How do I live with this? How do I make it work for me? It’s like management. It’s like having a slipped disk. 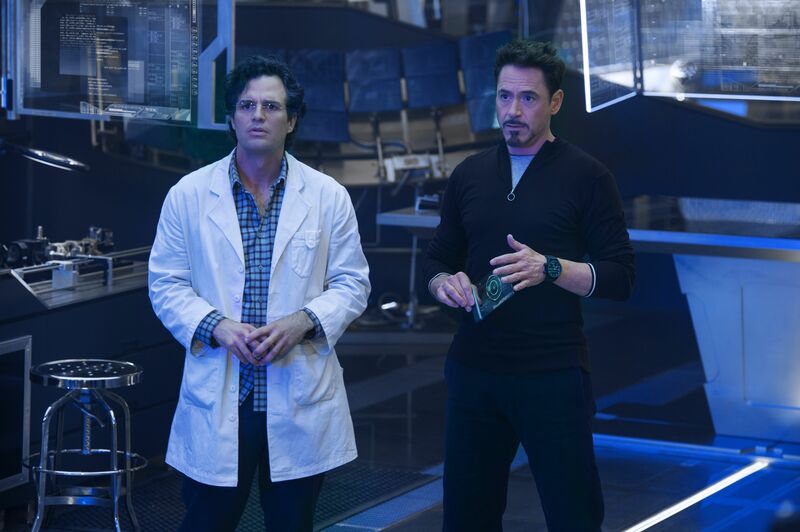 I was curious about that, because he has the labs and he manages a lot of scientists there, you would think the Hulk would be the number one priority, but then you lose the Hulk from the team. Tony doesn’t want to lose the Hulk obviously. Because the Hulk is useful to the team. RUFFALO: Yeah. Yes, in little doses. He’s like a nuclear bomb. It’s tough to get very tactical with it, so he’s – I think it’s a matter of management and control really at this point, rather than just shutting him down completely. Plus the weird thing about the Banner/Hulk relationship is that the more work they do into it, the more he turns into the Hulk, the more established the Hulk becomes in his identity. So you have these two identities that really want to dominate the other. So it’s not getting easier for one or the other to be the dominate driver. Can they co-exist, do you think? RUFFALO: [Laughs] I don’t know, it’s tough, but they’re going to have to work it out because there’s serious tension there and it’s only growing.